Dr. Steven H. Turkeltaub is the medical director of the Arizona Center for Aesthetic Plastic Surgery, a cosmetic surgery practice offering a variety of plastic surgery procedures that address aesthetic concerns of the breast, body, skin, and face. Dr. Turkeltaub offers several options for those considering plastic surgery in Phoenix and surrounding areas. 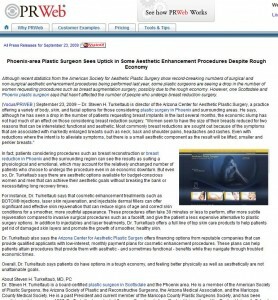 In this article, Dr. Turkeltaub discusses how the economy has impacted his Plastic Surgery practice through Phoenix, Scottsdale and the surrounding areas in Arizona.